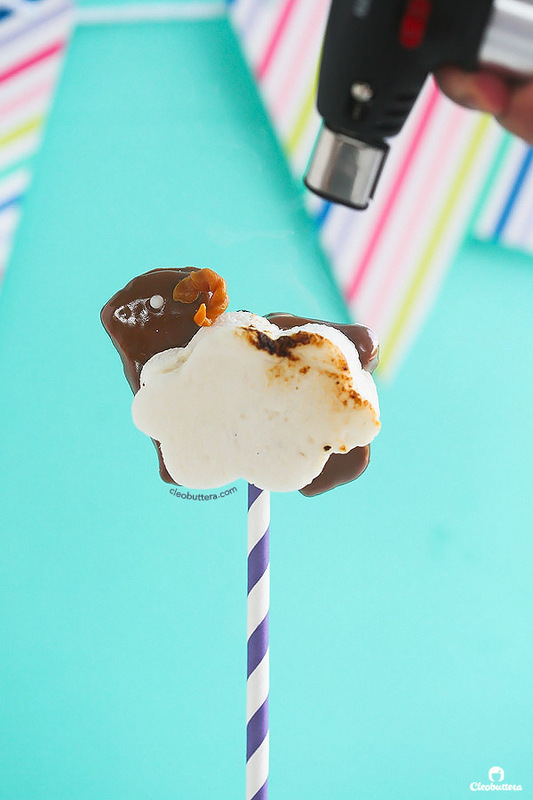 S’mores just got a little cuter and mighty tastier! 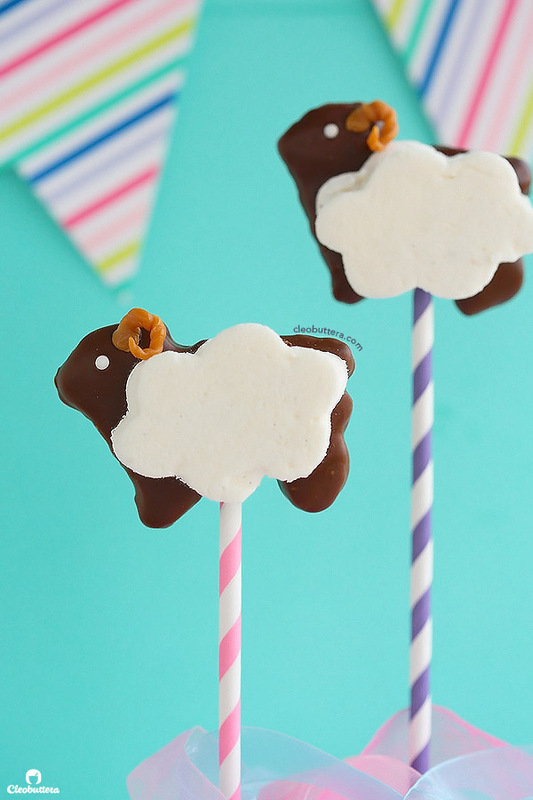 These sheep-looking treats are made from squishy soft homemade marshmallows atop chocolate dipped, homemade graham crackers mounted on sticks. Perfect for Eid and other fun occasions! Every year around this time, when Eid Al Adha rolls by, each of my 3 kids’ classes (individually) throw a dish party to celebrate. Guess which sleep-deprived mom always, and I mean always, gets assigned to send in the cupcakes? For ALL THREE CLASSES?! GAAAAAAAAAAAHHHHHHHH! It’s not that I’m complaining…I mean I LOVE baking…but its not like I could simply send cupcakes that just taste good like these. Noooooooooooo! The kids specifically ask for sheep decorated ones! And when you spent hours upon hours making 60+ cupcakes piped with grass frosting and topped with chubby fondant sheep toppers, you start having the weirdest thoughts like how it’s like to have wings. And then you lose sense of your arms. And you wonder if you might actually need glasses after this. And then when you finally go to sleep, you dream of…you guessed it…sheep cupcakes!!! So for the blog, I’m all sheep cupcaked out! Non. Nil. Not a chance. Not this year. I need some time to recover. Instead, I’m making you sheep S’MORES! 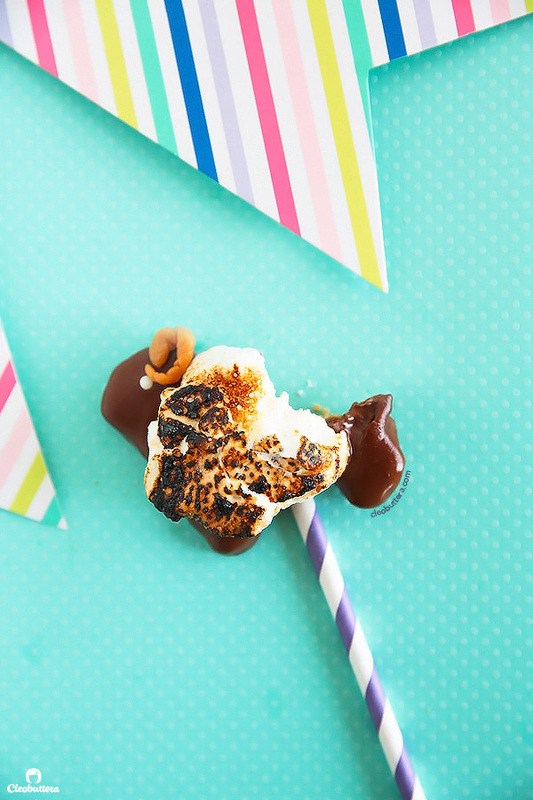 Because when it comes to S’mores…I always want “some more”! But why sheep you ask? Well these wooly little animals are quite significant to the meaning of the holiday. You might wanna think of it this way…sheep to Eid Al Adha (Feast of the Sacrifice) is kinda like turkey to Thanksgiving. We don’t have to eat it (I don’t; not a fan) but its meat is given out to the less privileged. Of course the holiday is a lot deeper than to be wrapped up in a sentence or two, and let’s face it, I know you’re here for the food and that you know how to use google if you’re interested to know more. Here in Cairo, sheep get the spotlight! Its sheep decorations at the mall, sheep stuffed animals for sale in the street, lame sheep joke forwarded texts and sheep cupcakes at bakeries. Bakeries?! What hadn’t it ever occur to me?! 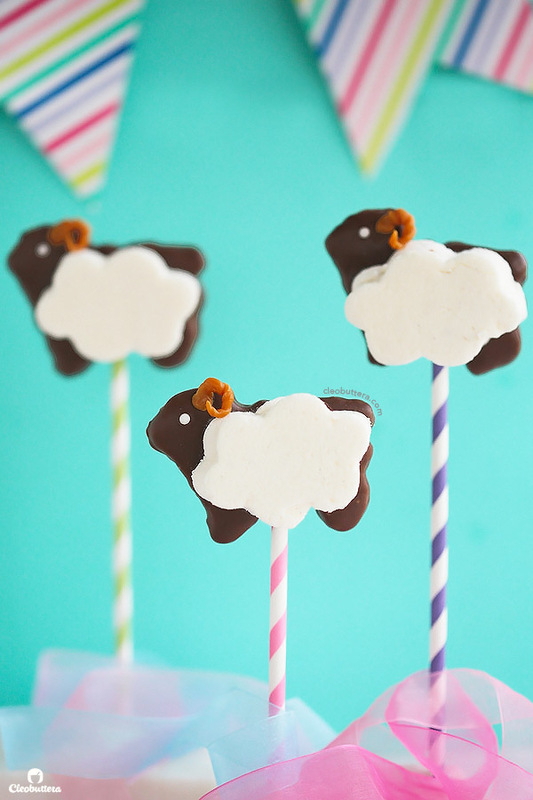 And now the newest addition to the Eid sheep extravaganza…The Sheep S’more! 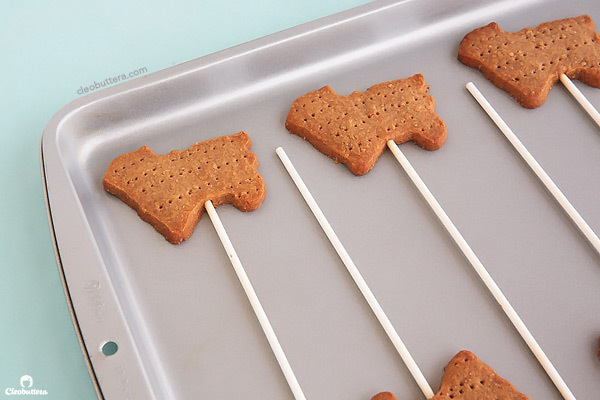 Because everything on a stick is infinitely cuter. At first, I though of making sheep shaped sugar cookies with beautifully piped royal icing. But then I started toying with the idea of adding mini marshmallows in place of the fleece. 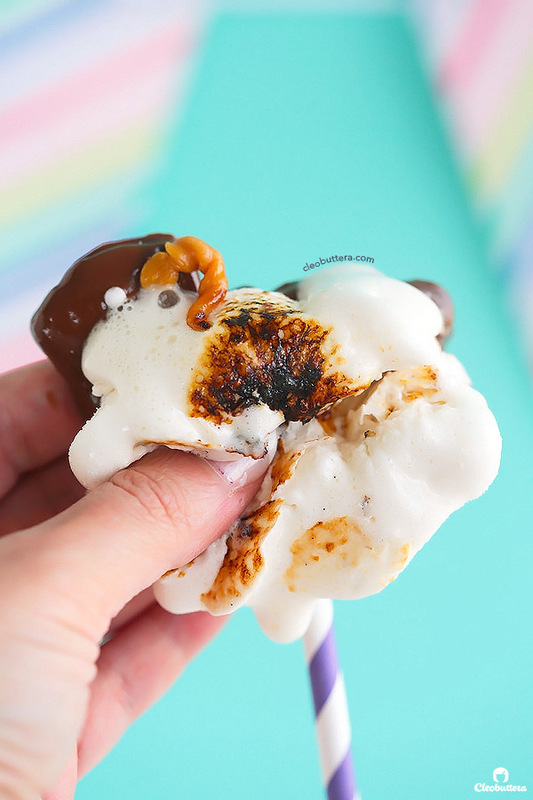 And whenever I think of marshmallows, my mind immediately shifts to S’mores. So before I knew it, the sugar cookie got replaced with graham cracker cookies and the royal icing with chocolate. 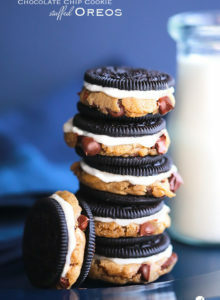 Move over pretty sugar cookie but a less pretty, yet way tastier s’more cookie just took your place! Other than we won’t be able to eat regular s’more again, because the homemade factor of these, just spoiled our taste buds. I’m not gonna sugar coat this, the recipe is a bit involved. It’s a several stage process, and not something you could whip in under an hour like this. Each component of the recipe is actually not complicated at all, especially for those who have made sugar cookies and its likes before, however some planning ahead is necessary. The Sheep S’more Pops starts with some plush homemade marshmallows that are miles squisher and softer than the store bought kind. After the marshmallow is set, it gets cut into fleece/cloud shapes, that you will make you say: cuuuuuuuuute! If you’re so inclined, you could ditch this step and use a bunch of mini marshmallows instead. I’ll forgive you. A homemade graham cracker dough is then made….uh-mazing btw. Storebought graham crackers taste like cardboard compared to these. The dough gets cut out using a sheep cookie cutter, although this is the least convincing personification of a sheep I’ve ever seen. So with that said any animal cookie cutter will do 🙂 Cutting the dough that has been chilled in the freezer, makes life so much easier, so make sure its cold. Then some lollipops get inserted and the surface gets pricked using a fork. (You could leave out the sticks if you just want regular cookies) Then into the freezer for another 15 minutes to get them firm. This prevents them from losing their shape while baking. See? Still looking like an animal. I won’t say sheep because this is one lousy cookie cutter I have. Bonus! Your house will smell heavenly at this point. After they cool, they’ll get the most delicious dive in a pool of chocolate. Lucky sheep graham crackers!!! Give it a few minutes of resting to allow it to slightly set, then add on an eye on each “sheep.” I used white confetti quins, but use whatever you have that could work for an eye. Freeze it a little to set the chocolate. Dab a little smear of chocolate on the back of the uglier side of the marshmallow and use it as a glue to stick the marshmallow fleece cloud on the “sheep’s” back. And if your sheep cookies don’t scream sheep like mine, then you might want to add a few more details to help it get there…like horns! Yummy yummy horns! Made from soft caramel candies. Twisted to make it look like horns, then stick it with another dab of melted chocolate. And there! Your flock is all dressed up for Eid! Or Easter if that’s your thing! Or is it lamb in Easter? They’ll work as lamb too. Or a farm themed birthday party! Or campfire farm themed birthday party! Sorry I’ll stop now…I haven’t slept in a long time. I’m just gonna roast one…. And wish a blessed one! This is a multi-step recipe, and while non of them is complicated, they do require some planning ahead. The marshmallow needs at least 6 hours to set and the graham cracker dough needs about 1 hour of chilling time, so it's best to space the work over 2 days. This is what I did. The night before, I prepared the marshmallow and set the pan aside overnight. I then made the graham cookie dough, on that same night and left it to chill in the fridge overnight as well. The next morning, I cut out the marshmallows, baked the cookies, dipped and assembled them. However frozen cookie dough cut outs will keep in the freezer for weeks and the baked cookies keep well in an airtight container for several days, so these could be prepared in advance too. Sift the marshmallow coating ingredients (confectioners' sugar & cornstarch) together in a medium bowl and set aside. Lightly coat a 9X9inch baking pan (*see note) with non-stick cooking spray. In a small bowl, whisk together the gelatin and cold water and allow to soften for 5 minutes. In a small saucepan, stir together the sugar, 1/4 cup of the corn syrup, water, and salt and bring to a boil over high heat. Stir occasionally as it boils, until the temperature reaches 240°F/116°C. Meanwhile, pour in the remaining 1/4 cup corn syrup in the bowl of an electric mixture fitted with the whisk attachment. Heat the gelatin mixture in the microwave until completely melted and all the granules have dissolved, about 30 seconds. Pour into the mixer bowl with the corn syrup and mix together on low speed. Keep the mixer running until the sugar syrup reaches the right temperature. When the syrup reaches 240°F, slowly pour it into the mixer bowl in a steady stream. Increase the speed to medium and beat for 5 minutes. Then increase to medium-high speed and beat for another 5 minutes. Add in the vanilla, then turn to the highest setting and beat for 1 to 2 more minutes; until the marshmallow is opaque white, fluffy, and tripled in volume. When the marshmallow is ready, dust a work surface with marshmallow coating. Use a knife to loosen the marshmallow from the edges of the pan. Invert the marshmallow slab onto the work surface. Use paper towels to wipe off any access cooking spray from the surface, then dust it with more coating. 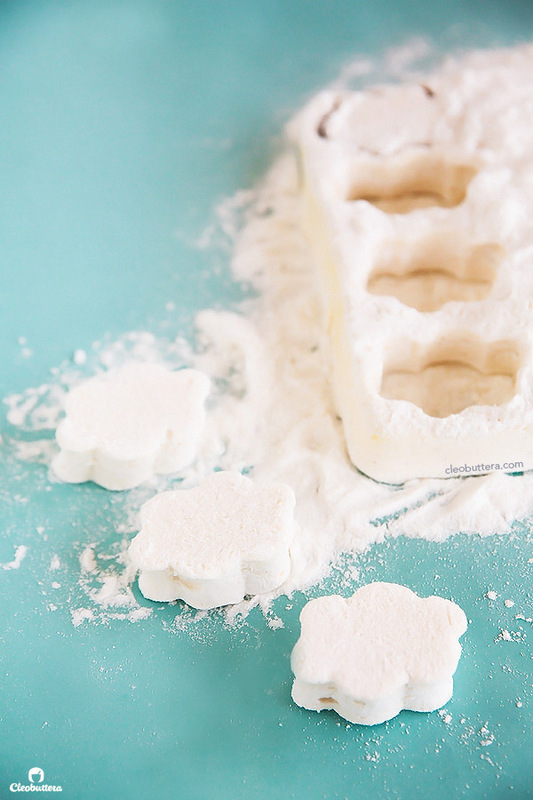 Use a cloud or squished down flower cookie cutter to cut into the marshmallows. Dip the sticky edges of the marshmallows in more coating, patting off the excess. In the bowl of a food processor, combine together the all-purpose flour, whole wheat flour, brown sugar, salt and cinnamon and blend to evenly combine. Add the butter pieces and honey and pulse the food processor until the mixtures comes together into a shaggy dough. Turn out the dough onto a sheet of plastic wrap and lightly knead until it forms a uniform dough, then pat it into a 6-inch disk; wrap well. Refrigerate until firm, but still pliable, about 1 hour or up to overnight. Line two baking sheets with parchment paper or silicone baking mats. Turn out the dough onto a lightly floured piece of parchment paper and roll out to a little over 1/8 inch thick. You just want to make sure that its slightly thicker than the lollipop sticks, so you could easily insert them in. Gather the dough scraps and reroll as necessary. Using the parchment as a handle, transfer the rolled out dough onto a cookie sheet or tray and freeze until firm but not solid; about 15 minutes. Chilling the dough at this point is optional but makes cutting out shapes so much easier. Meanwhile, adjust the oven rack to middle position and preheat oven to 350°F/180°C . 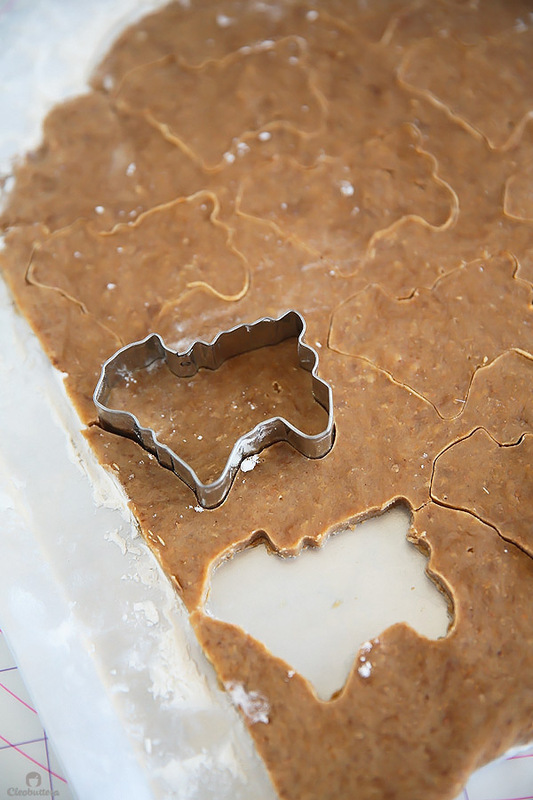 Using the sheep (or similar animal) cookie cutter, cut out shapes from the cold dough, then gently transfer the cut-outs pieces on the prepared baking sheets, 8 per sheet. 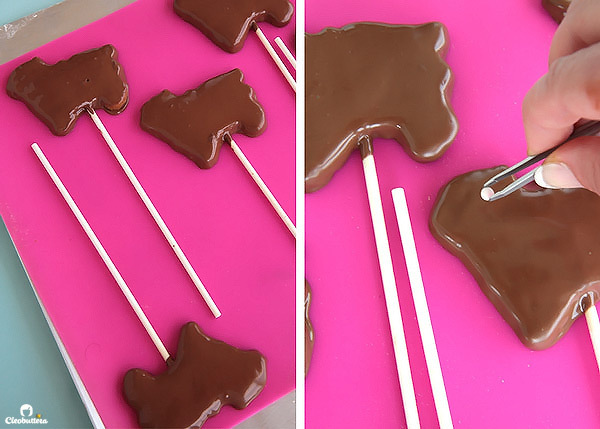 Carefully insert one lollipop stick into the bottom of each animal cracker by gently screwing in the top of the stick almost 3/4 of the way through. Prick the cracker several times with a fork. Freeze the crackers for at least 15 minutes before baking. Bake for 14 to 16 minutes until golden and firm around the edges. Allow the crackers to cool on the baking sheet for 5 minute then transfer them to a wire rack to cool completely. First, line 2 baking sheets with wax paper or silicone mats. Now melt the chocolate. In a microwave-safe bowl, heat 6 ounces of the chocolate (3/4 of the total amount), stopping the microwave and stirring every 10 seconds until two-thirds of the way melted, 1 to 2 minutes. Remove from microwave and keep stirring until melted all the way. Add remaining 2 ounces of chocolate, and stir continuously until melted. Return to the microwave for no more than 5 seconds at a time to complete melting if necessary. 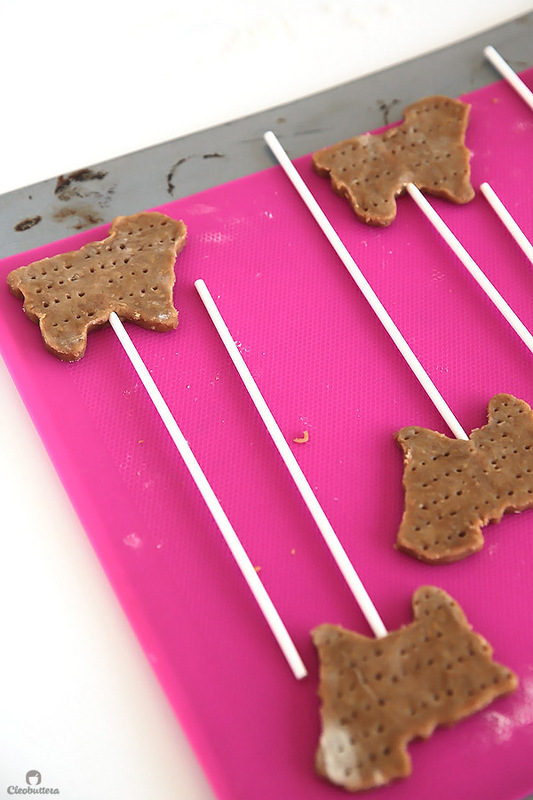 This melting method will quickly temper your chocolate, giving it the perfect temperature to set over the crackers. Time to dip! 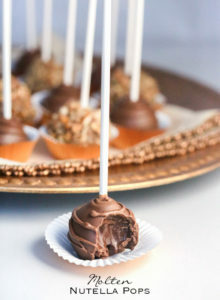 Using the lollipop stick as a handle, dip the crackers into chocolate, using a spoon to help cover the entire cookie. Gently shake the cracker back and forth to allow the excess chocolate to drip back into bowl. Place on the prepared cookie sheet. 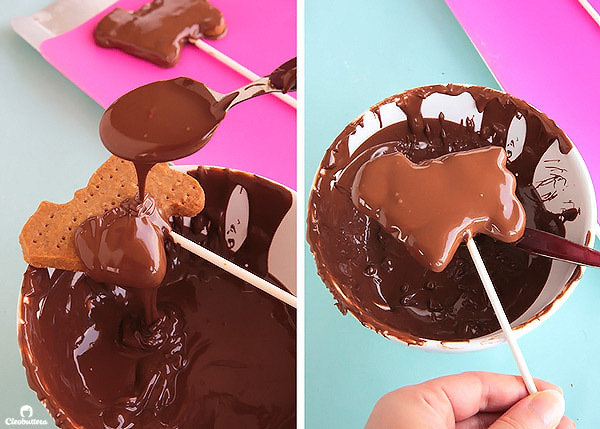 Allow the chocolate to set for a few minutes, and meanwhile make the horns. 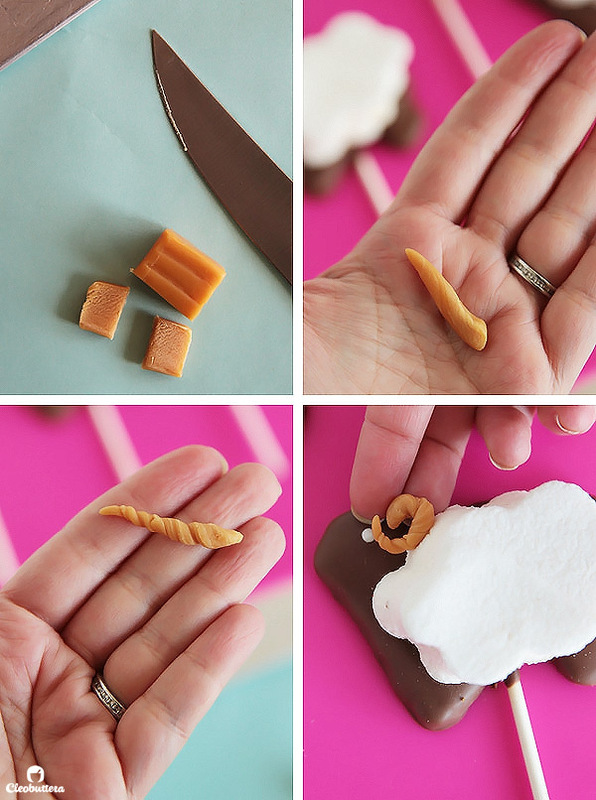 Cut a soft caramel candy into 8 piece, then using your roll and twist each piece to form a horn. (You could prepare these hours or even in advance). Using tweezers, place one white confetti quin in place of the eye and a caramel horn in place of the ears. Place in the freezer for about 10 minutes to set. 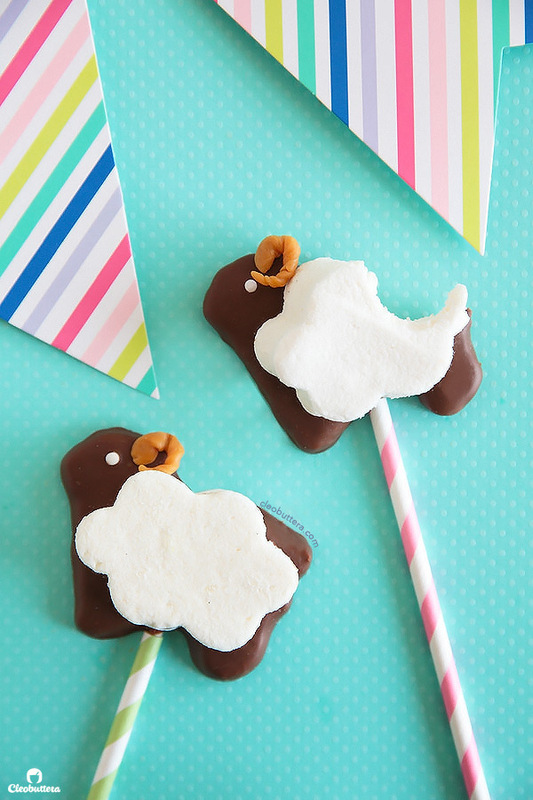 Spread a dab of leftover melted chocolate on one side of each marshmallow fleece cloud, then use this side to glue the fleece cloud on top of the sheep cracker. Return the assembled s'more pops to the freezer for a few more minutes till the marshmallow fleece clouds are stuck. 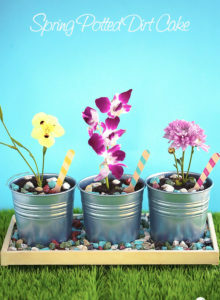 If desired, slide colorful paper straws over the lollipop sticks for a fancy presentation. Serve as is or roast the marshmallow with a kitchen torch. Enjoy the fruit of your labor! The pops will keep in an airtight container at room temperature for several days. The original recipe for the graham crackers calls for 'stone-ground' whole wheat flour, but I used the standard type, because its what I had on had and it worked perfectly fine. With that said, the choice is up to you. You could double up the recipe and make extra classic square shaped (or any shape) graham crackers for snacking, because they are that good! For the chocolate coating, I used a mixture of milk and semi-sweet chocolate. Milk chocolate is more classic to s'mores, but semi-sweet and dark chocolate set better, so I chose to do a mixture of both to achieve a good balance between taste and stability. I used 5.3oz/160g Belgian milk chocolate from Gourmet Egypt, and 2.7oz/77g Hershey's semi-sweet chocolate chips. 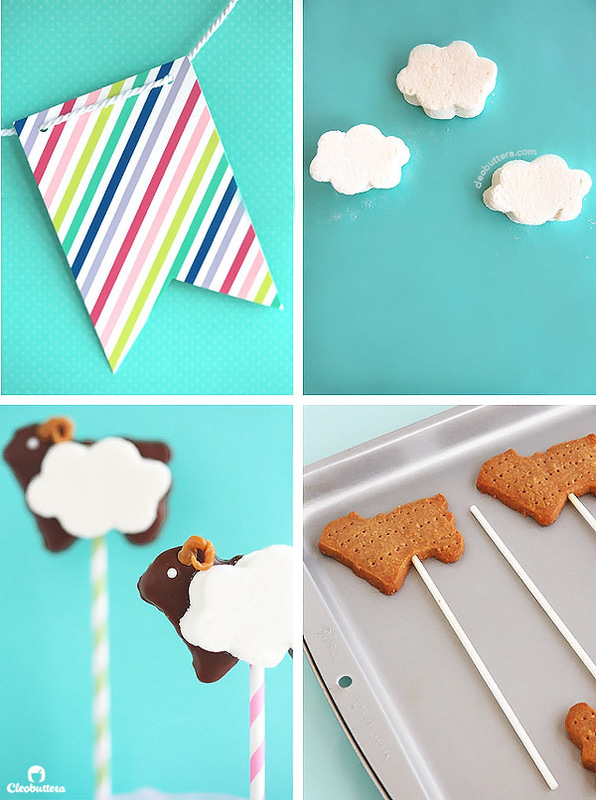 Any cloud or flower-shaped cookie cutter will work to make the marshmallow fleece cloud. I used this 2 1/4 inch flower cutter from wilton and pressed it down to create the cloud shape. 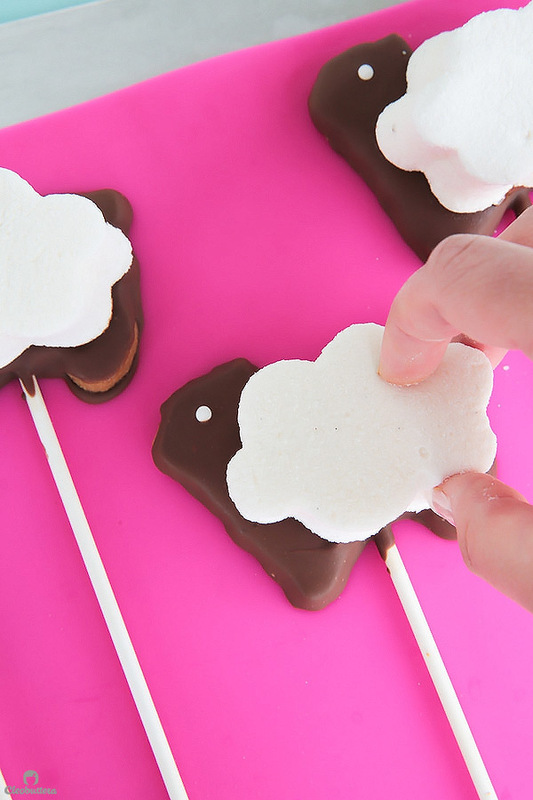 A 9X9 inch pan will make 14 (3 x2 inch) marshmallow clouds with a thickness of 3/4inch. If you'd like them thinner, so they're not so puffy, spread the marshmallow batter in 13X9 inch pan. This will also yield more marshmallow clouds. Attention Cairo shoppers! You could find the powdered gelatin and light corn syrup at Darb El Barabra shop (for pastry speciality supplies). They have a location in both Heliopolis and Mohandiseen. Lollipop sticks could be found at Tulip. Um, these just might be the cutest thing ever! You are seriously one of my favorite blogs…every recipe is so creative and every photo is so gorgeous! Elizabeth its always incredibly special when I get bloggie compliments from you because you are truly one of my blogging idols. I’m so humbled (and extremely happy and doing a happy dance right now!!!) that I’m one of your favs. The feeling is absolutely mutual girl! these are adorable. you’re right – everything is so much cuter on a stick. Eid Mubarak to you! These look adorable!! My son would love these. Wishing you a belated Eid Mubarak. Trust me these even taste better than they look. The kids in my family went bananas over them! I hope you could try making them for your son.